Gluten-Free Living > Tips > I’m in the mood for soup tonight. Do you have a great soup recipe? I’m in the mood for soup tonight. Do you have a great soup recipe? 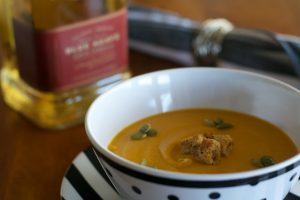 Try Blue Agave Roasted Yam Soup. Roasting the yams brings out their full, sweet flavor, while the cinnamon and nutmeg are very subtle but add to the complexity of flavors. The blue agave tequila adds depth while tempering the sweetness.